It’s time for Comic of the Week Part 5! 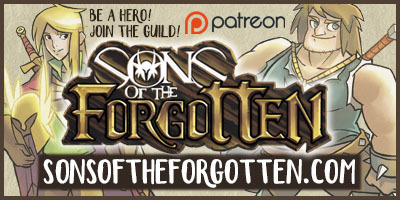 Sons of the Forgotten – An adventure webcomic that happens in a fantasy world called Freyka where Erric, our main character, will leave his calm village against his father’s wishes to follow his dreams of becoming a hero. It is an adventure built out of epic scenes, sense of wonder, discoveries and, most of all, friendship. It is a journey where we will discover, following our main characters, a truth that is hidden from all. One of the newest additions to SF, SotF is a fantasy comic with some great art and a big story ahead. It’s still pretty early in the story, but it’s off to a great start, so now’s the perfect time to jump in! Go check it out!